If you missed it, I recently brought The Glamour Beauty Power List Box and this is one of the lipsticks I received in that. I do love a good lipstick and I always seem to wear them most in the winter seasons as I do love a good berry lip! In the box there were 3 possible colours you could receive. I got shade 875 Gladiolus, a gorgeous super bright red! I've read some brilliant reviews on this product and it promises so much! It's a wax free, high definition gel that provides a weightless feel with smooth application. Just one coat offers true colour transfer and leaves lips moisturised. It comes in 14 different shades and comes with a scent of whipped vanilla and creamed mango. I'll start with smell. I usually hate scented lipsticks! It's a total pet peeve of mine but I must admit once it's on you don't notice the scent. It's meant to be whipped vanilla and creamed mango but if I'm honest it just smells like cheap vanilla, sickly cheap vanilla. I adore the smell of vanilla but it smells like the cheap scented makeup you can buy for children. I'm really not feeling it. Colour wise, it is exactly the colour it appears straight out the tube. It's a rich red that's super pigmented and you don't need to build the colour up (unless you want too of course!). 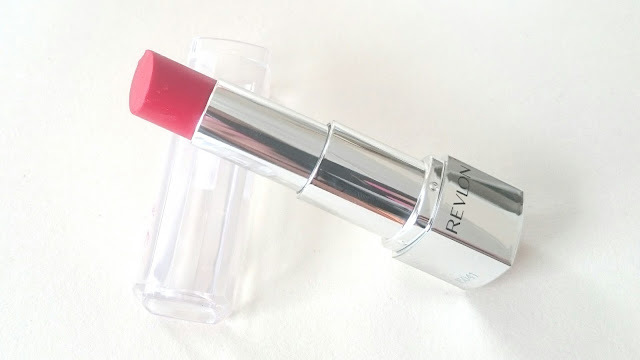 I was super impressed by how easily it glides onto the lips and easy it is to remove, I adore red lipstick more than most other shades but hate when they are super dry or it takes a good few coats to get the colour that actually looks like the lipstick bullet itself. I haven't fallen in love with this lipstick if I'm honest. 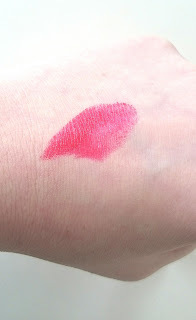 It has no staying power what so ever, which is fab if you've made a mistake or smudged it but not so great when you actually don't want to constantly top your lippy up! The feeling on the lips is a bit like lip balm that doesn't sink in. Unlike with a traditional wax based lipstick, that for 5 mins or so you know you have on, the feeling just wouldn't go away. It feels like it's just there, sitting on my lips waiting for me to accidentally touch my face so it can run off into the sunset. The only way I've been able to use it is to apply it to the center of my lips, then rub it on with my finger, so it creates a kind of stain. Another problem I've had with this lippy is no fault of it's own. Due to the fact I got in the box and couldn't pick a shade means it doesn't suit me. At all. I love red lipsticks but I have to wear blue based and unfortunately this gorgeous red is orange based. 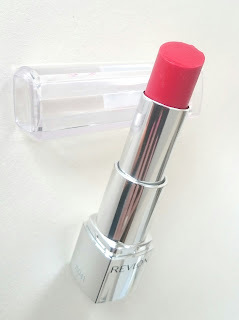 Overall I'm not super impressed with the Revlon Ultra HD Lipstick, I'm not sure if it's the colour or the feeling but I very much doubt I'd fork out £7.99 and try it again in a different shade. Have you tried it? I'd love to know your thoughts! Beautyfull color! I love it! I have this lipstick as well, it's a really nice colour but my favourite is Orchid - that is one of the prettiest pinks ever! I find that their twist up lip pencils are more matte and long lasting so maybe you should give them a go.